CopyPod allows to backup - copy - transfer your iPod Music to your PC. CopyPod is ideal after a hard drive crash or viruses, before sending your iPod for repair or simply to move your iPod Music to a new PC. Features include: backup all song types (MP3/AAC/WAV/AIF), backup directly to iTunes saving your Playlists and Ratings, cool iTunes like design, rename songs on backup, backup albums in separate folders, find duplicates and more. For security reasons, you should also check out the CopyTrans download at LO4D.com which includes virus and malware tests. Additional screenshots of this application download may be available, too. 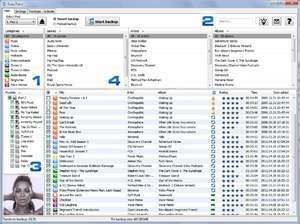 iPod tools reviewed are perfect companions to managing and keeping your iPod up-to-date with these useful and perfect programs. Editors review some of the best tools and users are encouraged to participate. Check out some of the freeware downloads available in the ipod utility category. They contain no strings and are available at zero cost. 5 out of 5 based on 11 ratings. CopyPod has a presence on social networks.